Environmental groups and residents gathered to protest on the impending seismic testing pursued by the Trump administration. The rally took place at noon at Beach Ave in Cape May. CAPE MAY — Capt. Jeff Stewart of the Cape May Whale Watcher knows better than most how whales and dolphins are affected by sound, even the tick-tick-tick of his fish finder. Environmental groups and residents protest on the impending seismic testing pursued by the Trump administration. The rally took place at Beach Ave in Cape May. U.S. Rep. Jeff Van Drew, a Democrat from Cape May County newly elected to Congress, told the crowd he has co-sponsored bills to ban seismic testing and oil drilling in the ocean, even as the federal Bureau of Ocean Energy Management is preparing to rule on applications that would allow five oil and gas companies to test in areas along the Atlantic Coast, and is working on a five-year proposal for offshore drilling. Van Drew said that the issue crosses party lines, and that banning seismic testing is pro-business as well as pro-environment. He said he was disappointed that President Donald Trump, whose own business history includes casinos along the Jersey Shore, would green light the testing. Seismic testing uses air-gun blasts to search for oil and gas resources beneath the ocean, a method researchers have said could harm marine mammals. Rep. Jeff Van Drew speaks during a protest on the impending seismic testing pursued by the Trump administration. Environmental groups and residents gathered for the rally at Beach Ave in Cape May. The New Jersey Legislature has passed a law that would effectively prohibit permits for testing in state-controlled waters, which stretch three miles out from the coast. Anna May Coones and Margo Waring of Cape May said they are Trump supporters in general, but came to the rally holding signs reading “Don’t Drill Our Coast” and “Oil & Water Don’t Mix!” They said they hoped Trump would take note of the New Jersey protests and put a stop to any imminent testing or drilling. Cindy Zipf of Clean Ocean Action said the administration’s draft drilling plan would affect just about “every lick of ocean waters” in the country. “This is a nonpartisan issue,” she said. She said every governor along the Atlantic Coast is opposed to offshore drilling. Sandra Meola of the New Jersey Audubon Society said climate change, and the reliance on fossil fuels that is behind the desire for the seismic testing, threatens the hundreds of migratory bird species that rely on clean beaches as they fly over during their migration. “Our ocean and vulnerable coastal communities are no place for fossil fuel development and seismic testing,” she said. 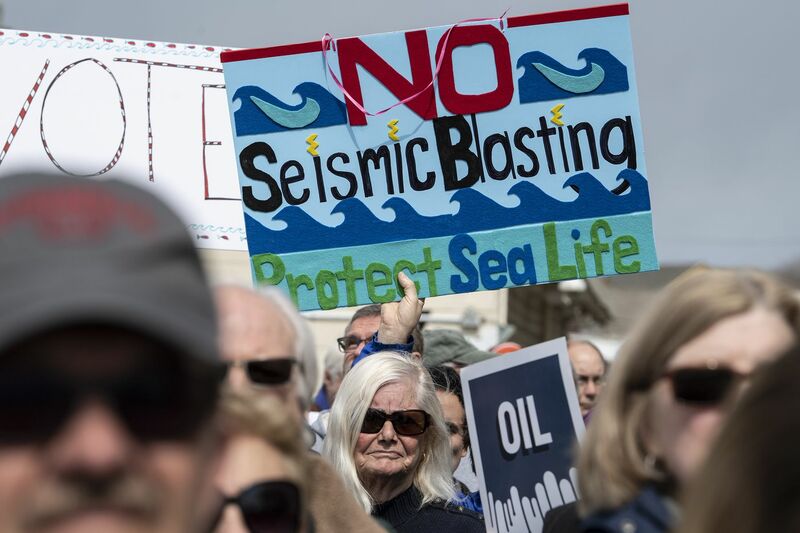 Environmental groups and residents hold signs during a protest on the impending seismic testing pursued by the Trump administration. The rally took place at noon at Beach Ave in Cape May. The permitting documents, she said, indicate that the effects would be felt from Cape May to Cape Canaveral, Fla., with effects experienced for up to 1,800 miles.